One differentiates between disposable trays and reusable trays, the basic difference is the material thickness. A returnable tray serves as a shuttle packaging, which is usually returned to the supplier after filling. This forms a closed circuit. Disposable trays, on the other hand, are usually designed with thin walls in order to achieve the lowest possible material consumption. 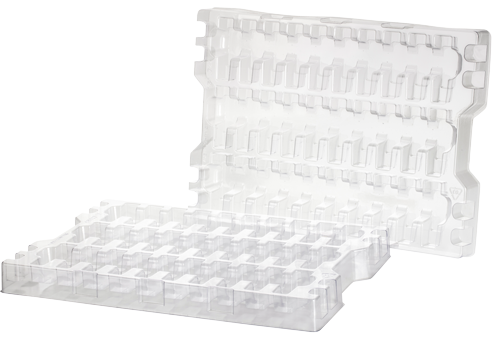 Disposable trays are ideally suited for long transport routes, overseas transport and air freight, as these do not have to be returned to the sender like shuttle packaging. Our disposable trays are provided with material marking in order to improve the recycling routes. Depending on the area of application and requirement, disposable trays can be designed in clear or coloured. We only use recycled material, which we process in our own mills. Disposable packaging is also available in PLA (biodegradable). 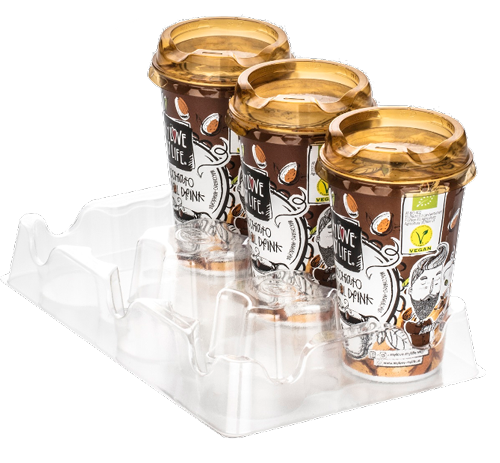 In addition to disposable trays, our portfolio also includes other types such as transparent packaging, which we manufacture according to your individual requirements. These include sealing blisters and blister hoods, sliding blisters and Hf blisters. We help you to solve your packaging problem.